About Am I Hungry? 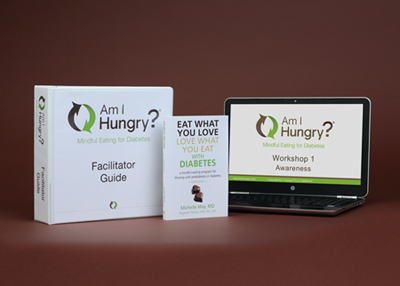 Mindful Eating for Diabetes Facilitator Training - Am I Hungry?Am I Hungry? Am I Hungry? Mindful Eating for Diabetes Facilitator Training will prepare you to offer a comprehensive diabetes education and training curriculum using mindful eating principles. This diabetes education curriculum was designed to help people with prediabetes or type 2 diabetes adopt self-care behaviors and make sustainable lifestyle changes to improve health outcomes and quality of life. Download the complete information packet from the sidebar on the right. The Am I Hungry? Mindful Eating for Diabetes education curriculum may be used to provide Diabetes Self-Management Training (DSMT) services as part of an accredited program. This diabetes education curriculum for people with Type 2 Diabetes was designed to meet the National Standards for Diabetes Self-Management Education NSDSME Standard 6: Curriculum. BONUS: Six 1-hour Counseling Training sessions that provide practical tips and motivational interviewing examples to enhance your effectiveness while working one-on-one with your patients and clients. Complete the form on the right to download the complete Am I Hungry? Facilitator Training for Diabetes information packet. This packet has all the details you’ll need including FAQs and registration links. Am I Hungry? Mindful Eating for Diabetes Program brief overview. Download the complete Am I Hungry? Mindful Eating for Diabetes Facilitator Training Information Packet.